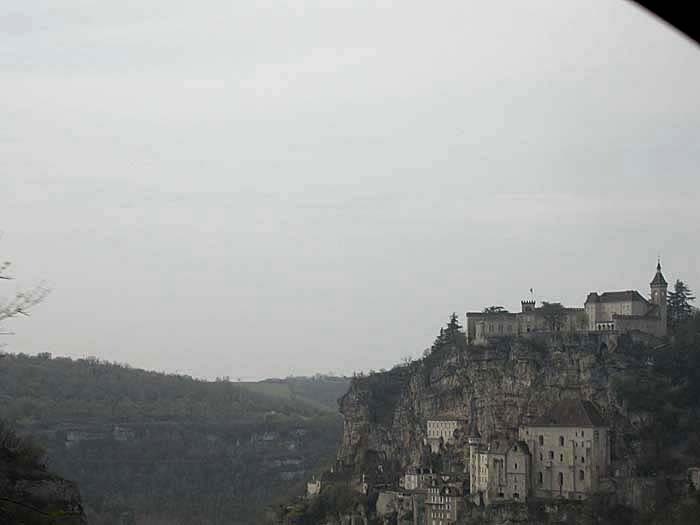 Rocamadour was visited as a side-trip for lunch and for a sightseeing ascent to the church and ecclesiastical buildings stuck to the side of an enormous cliff about twenty miles through the hills from Souillac. We took the more "adventurous" road in--a curving, shoulderless, 1 1/2 lane rollercoaster along steep cliff edges. Like all such roads in the region is it officially a two-way road, but if there had been traffic, then we'd have had to stop and back up to a wider place for passing any number of times in its 12 mile length. Miraculously, this was never necessary, though we did encounter large TRUCKS entering such roads other places in the region, and cannot imagine how many deaths and narrow escapes are owed to this back-country traffic arrangement. We lunched in a nondescript restaurant inside the town walls after parking our car outside them. We then took an elevator roughly half way up the cliff to a staging point where stairs--hundreds of them--and switchback ramps allow you to climb to the church at the top. The church is home to yet another "black Madonna" much venerated in the region, but we were there for the views across the valley, and to marvel at the ability of the French builders to situate such structures on the vertical cliff face. Our return trip to Souillac was made on the wider, less vertiginous exit road. Another claim to fame: Rocamadour cheese, a chèvre, is sold in little medallions a third the size of a hockey puck, and tastes as heavenly as one could ever expect from cheesemakers who live in the shadow of these spiritually charged stone battlements.